CASTLE’s Alexis is going through a bit of a hard time with her father right now, which makes this Monday’s episode all the more awkward for her: as their personal life is hitting a bump, she needs Castle and the rest of his NYPD buddies to help her prove that a man on death row is actually innocent. And the kicker? They only have 72 hours to do it. CASTLE is still several months away from returning, but fans can get their dose of the show with TNT reruns and ABC’s Sunday night re-airings of season 5. CASTLE has had quite the range of finales over the past several years (splits, death, shootings, coupling), and “Watershed,” the season 5 closer, is shaping up to be quite the hour. 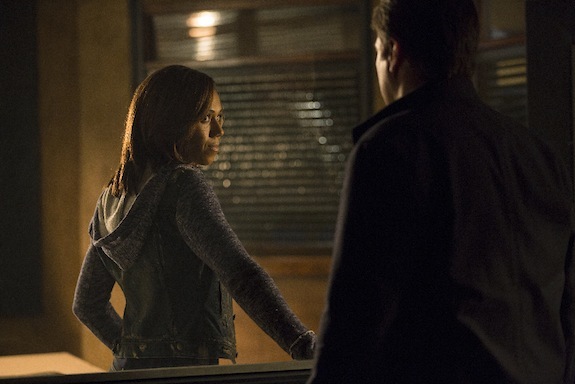 CASTLE’s annual two-part arc kicks off on Monday, and instead of things being deadly on a grand scale, the stakes are much more personal for Castle — his daughter, Alexis, has been kidnapped.